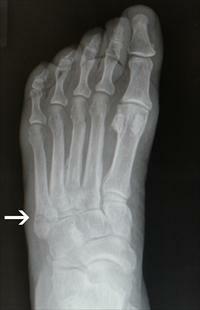 A “Jones’ fracture” is a special type of stress fracture of the base of the 5th metatarsal (Figure 1). The fracture itself often occurs acutely but the repetitive stress that leads up to the sudden fracture has often built up over time. Jones fractures occur in a manner that is similar to the way that you would break a paper clip (by wiggling it back and forth over and over again). Therefore, activities that repetitively load the foot (for example sports with running) may lead to a Jones’ fracture. These fractures tend to occur in people that have a high arched foot shape, or a leg shape that results in increased loading on the outside part of the foot. These fractures can be treated with a cast or a special boot. 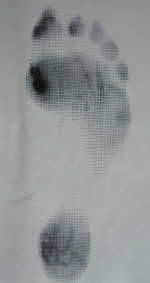 However, they may break again because the reason why they occurred (loading pattern of the foot) has not changed. Therefore, surgical treatment of Jones’ fractures is common, and it sometimes involves re-aligning the foot to prevent the bone from breaking again in the future. Individuals who suffer a Jones’ fracture will report pain on the outside of the midfoot (Figure 2). This pain can be quite sudden corresponding to when the fracture fully breaks through the bone. Patients will have difficulty bearing weight and may walk with a limp. In most instances, the patient will describe exactly when the fracture occurred, often after landing heavily or performing some other demanding but routine activity. However, sometimes the main symptom will be a chronic (long-term) ache in the outside part of the foot – representing a developing stress fracture of the base of the fifth metatarsal. Many patients will report a history of some pain in the foot, prior to the actual break. 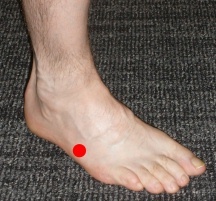 It is possible to have the problem in both feet, although usually one side hurts more. Patients with a Jones’ fracture will have pain at the fracture site (Figure 2). Often they will have high arched feet and/or an alignment of the lower extremity that tends to load the outside part of their feet (Figure 3). Sometimes, when looking at these patients’ shoes, one will see excessive wear of the outside of the sole because of the pressure put on that part of the foot and shoe. Plain x-rays will identify a Jones’ fracture. The fracture itself occurs at the area where the more flexible bone at the base of the metatarsal, meets the more rigid bone of the shaft of the metatarsal. The fracture is different from a Dancer’s fracture which occurs when one of the ligaments pulls off (avulses) the tip of the 5th metatarsal base (Figure 4). 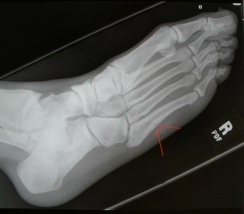 Notice in Figure 4A that the fracture line is further down the 5th metatarsal than a Dancer Fracture (figure 4B). Like most fractures, a Jones fracture will usually heal if the foot is protected from the forces of weight bearing for a long enough period of time. However, the area of the bone that is fractured has a relatively poor blood supply, so bone healing may be slowed. Furthermore, because the fracture is often related to repetitive stress to the fracture site, there is always a concern that the fracture may recur. A gradual return to activities in a protective (stiff-soled) shoe, once adequate healing has occurred. Although the fracture will usually heal with rest, it can take a prolonged amount of time (due to the poor blood supply), and it can re-break due to the underlying alignment of the foot or lower extremity. For this reason, surgery will often be recommended for many individuals with Jones’ fractures. This is particularly true for athletic individuals. The initial surgery involves stabilizing the fracture site by placing a strong screw through the middle of the bone (Figure 5). The stability helps the bone resist the forces that can slow healing, and drilling across the break stimulates blood flow to help healing. The after surgery treatment for this surgery is similar to that described above for non-operative management, but return to high level activities tends to be substantially quicker. 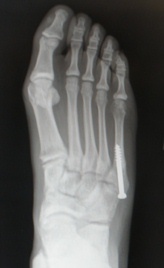 Dorsiflexing 1st metatarsal osteotomy – Cutting a wedge out of the top of the 1st metatarsal (the bone that the big toe is attached to) so that this bone can be realigned. This is done because often in people with high arched feet, the 1st metatarsal is angled downward and acts like a “kick-stand” to force the foot to be excessively loaded on the outside.